Very polite. Informative. Service was great. Hi Vicki! We're so glad you've had a good experience with Modern. Thanks for the great review! Thorough analysis of the problem. Answered all our questions. Hi Kevin! We're happy to hear that your questions were answered and you were pleased with the service. Thanks for the great review, and Happy New Year! We can't thank Zach, our technician, for all of the time and effort he has put in to rid our building of mice and "ladybugs". He gave great suggestions on where to close off areas of access and always has a smile on his face. He is knowledgeable and friendly and we truly appreciate his professionalism. Hi Jill!Thanks for the great review! I have passed it along to Zach and his managers. We appreciate the feedback. Have a nice weekend! Prompt response, professional service. Now we wait to see how many critters don’t come in and how many go”away “! Hi Harvey! Thanks for the great review! Please let us know if you have any issues and need us to come back out. Enjoy your week! Happy with product but had difficulty with starting service last spring. Once straightened out we paid for a full month of service that started around May 25th. A lot of money for 6 days of service. Hi Bob! Thanks for the great review! Sorry to hear you had issues starting your Vector treatment. If you have any questions about it, please feel free to call us at 1-800-323-7378. Have a great week! Adam has been coming to our house for a number of years now. He is always professional and friendly. Because of him our home stays mouse and pest free. Hi Bob! Thanks for letting us know that Adam is doing a great job. I have passed it along to his managers. We appreciate the 5-star review as well! Enjoy your weekend! I called to sign up for services at a home. A good friend of mine referred me. I went online and saw the $50 referral bonus for new customers. I spoke with Katelyn. She was excellent, but put me on hold 4 times to talk with managers. She said they could not find my friend's name so I could not have the discount. I told her that seemed odd; especially for a new yearly customer. Ultimately I spoke with the manager, Kristina, and she said there was nothing she could do. I asked her if she understood that this is bad business turning away a new customer and potential happy client for a frustrated consumer and someone that would never say anything good about them. The call took 45 minutes...Move Katelyn up to manager- she gets it. I am now going to call the competition. Dean I would need a llittle more information in order to look into what happened here. I apologize for the confusion and the way this has been handled thus far. Could you provide me your locaiton address please and the best contact number to reach you. Very happy with Adam, he does a great and through job each time at my house. Hi Paul! We're happy to hear that Scott is doing a good job, and we appreciate the great review. Have a nice weekend! Great Service each time. Appreciate the 'heads-up' phone call reminder. Adam is a fine man, a pleasure to work with and a champ in all respects. Hi Nick! Thanks for the amazing review! We have let Adam know that you appreciate his service. Have a great afternoon! Hi Nathan! Thanks for the great review. We hope you remain satisfied with your Modern Pest service. Have a nice weekend! Modern pest has provided service to my main home as well as a lakefront house. From spiders to hornets to mice, they do a great job keeping my homes pest free! Hi Denise! It's great to hear that we're helping to reduce pests in both of your homes. Thanks for the great review! Very good at time of service, very professional. Still waiting to hear about follow up, was not able to complete due to rain. Hi Mark! We're happy to hear your service went well. Your follow-up is scheduled for 8/15. Please let is know if there's anything else we can do. Thanks! Fabulous service and accountability!! Always on time and on schedule! Great well organized company!!! review! We love hearing feedback, and we appreciate you taking the time to let us know how we're doing. Enjoy the rest of your week! Very honest assessment of my wildlife issue and available options! Hi Craig! Thanks for the 5-star review. Our Wildlife team is happy to help with any issues you have. Have a great weekend! Your serviceman is an excellent professional who went above and beyond expected by thoroughly examining our master bedroom and living room furniture for bugs. Hi Andy! We're so glad you had a good experience with your Service Professional. Thanks for using Modern Pest, and have a great week! The tech sent to us was friendly and knowledgeable.He explained everything as he was working . Hi Barrie! We're happy to hear you had a good experience with your Service Professional. Thanks for the great review, and have a happy 4th! I love Modern Pest Services. Always come out when you need them and very helpful. Hi Susan! Thanks for the great review! We're glad we can be there when you need us. Have a great weekend! The level of service and professionalism is stellar. Very happy with the services provided! Hi Stacey! Thanks so much for the amazing review! We really appreciate the time it takes to let us know how we're doing. Have a great day, and stay dry! Have been a satisfied customer for quite a few years now. Modern does a great job, people are always pleasant and professional and they come when called! Friendly, reliable. 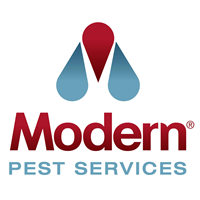 Modern pest services does a great job and is very helpful. Modern Pest ROCKS! They are our go-to pest control company! Professional, responsive and get the job done. Glad we changed our service to them years ago. Great decision! Staff are always friendly and helpful. Punctual and clean. We weren't there for this service as this is a summer residence. I had asked for the kitchen sink and bathroom sink cabinet doors to be left open as that is how I leave them. I noticed on your report that it said to leave ALL cabinet doors open. I surely hope that wasn't done. Gwen Richardson. Never shows up at the scheduled time. Everything is always and additional charge. Hi Brian, We appreciate the feedback and your comments about your recent service. I have forwarded your review to our customer service team and you should be hearing from a service manager shortly. We appreciate your business and hope to find a solution that meets your needs. Excellent response. Showed up on time. Very happy with the service. The technician did not show up or call to say they wouldn't be there. Hi Tom, Sorry for the miscommunication. Looking at our system notes, it looks as though a service professional was at your home on 12/11/2017. If you have questions related to your service, we encourage you to call our communication team directly at 207-747-3480. Very courteous and knowledgeable. The technician alerts you if there is a problem. He also explains solutions to any problem. Zach was very efficient and thorough. Came at the time he was expected. Good service. Helen, Thanks for the feedback regarding Zach. I will make sure that your comments are shared with our sales and support team. Have a great day! Peter has been doing my service for the past few years and does a great job. He is very thorough and explains any questions I have. He has a very friendly personality and easy to talk to. His experience is obvious. Hi Tom, Thanks for the excellent review. We are proud to have service professionals like Peter. I will share your wonderful comments with both him and the service team. Have a great weekend! The service call went very well. The technician was on time and very helpful and knowledgeable. Hello Mary Ellen, Thanks for the wonderful review. I will make sure to share your comments with our service team. Have a great weekend! The first tech that came tho my house rushed g through the process and i had to ask hom to do things that i was told would automatically be done. Hi Mark, I will pass along your comments to our leadership team. We want to make sure we are provided the level of service you expect from Modern Pest Services. Modern Pest Sevices arrived on time and immediately checked my attic as requested. Joshua was very informative and explained what was living in my attic and how it could be fixed. He also examined my chimney for a possible cap to keep any animals out. He was helpful and friendly. Hi Kim, Thanks so much for the warm comments. We love hearing when our service pros are thorough in their inspections. Have a great day! To the best of my knowledge you did not come. I was here most of day and left note in door that it was open, though instructions tell you to come in. I did not find a note indicating you were here in door or in house. Always very courteous and friendly. Excellent service without harsh chemicals. Hi Samantha, Thanks for the wonderful comments. We are proud of the services we provide and are thrilled that you are happy! It was okay- not special - I like our original technician. He always goes above and beyond. This time when I was fussing about bugs in the house the new tech went outside and put a dust out and around the house. When I asked if he had treated inside he told me no because he does not feel the bugs can get back out. When I said that there were may bees or hornets out on the deck this fall he agreed that it was a bad fall because of the weather. The reason we have you come is one of our grandsons is allergic to them and if he gets stung we have to be on our way to the hospital. We have always been happy before but now are becoming disappointed. What is the Home care green program? Hello, Susan. Thank you, so much for the feedback. We hope that through our subsequent conversations with you are feeling a lot more confident about your services going forward. We are happy to help out in any way we can! We are always just a phone call away! Thank you! Zach was very friendly and professional from the beginning to the end of the visit. I would like to make sure that I have the same technician each time. I don't like to have different people going through my home and would feel much better about having one consistent person whom I can trust. Hi Mona, Thanks for reaching out. I have shared your comments with our management and service team. Someone will be following up with your directly to ensure we are providing the best possible level of service. Needed inspection done in 24 hrs. They were the only ones to do step up and make it happen. They were very pleasant and acomidating, getting the paperwork to the Mtg company asap.